Homemade crunchy granola studded with walnuts and tart cherries is a perfect breakfast, especially over yogurt! 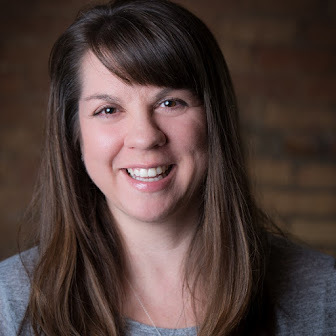 Do you make resolutions? At the start of each new year I always resolve to lose some weight. I'm pretty sure it's been the same resolution every year for as long as I can remember. I start out doing well but by the end of January it seems like I've fallen off the wagon. I know I'm not the only one that goes through this. I've heard from many of my friends that they go through this same routine, year after year. So this year I decided to give myself a break and have a more attainable goal. Instead of striving to lose weight, I'm going to take baby steps and focus on eating better and trying to exercise more. My eating habits have definitely improved over the last few years. I cook dinner just about every single night, my family eats way less fast food, and I've incorporated more fruits and veggies into our diet. My goal this year is to eat more whole grains and to experiment with the ones I've never tried before. I want to drink more water, eat even more fresh fruits and veggies, and add a couple of meatless meals to our rotation each week. For me this is a fun challenge as it means I get to play in the kitchen! 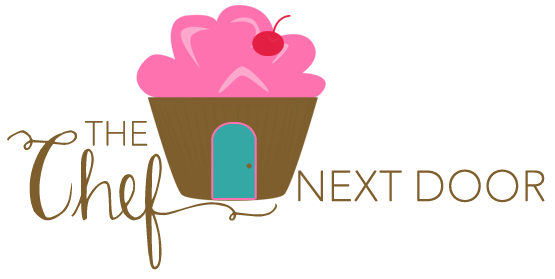 While you're still going to see my newest sweet treats here, be on the lookout for some deliciously healthy recipes too. This past weekend I decided to kick off my goals by making a batch of homemade granola. I love granola, and so does my oldest son. I can eat it by the handful as a snack, pour some milk over it and eat it as a cereal, or even use it as a yogurt topper. The latter is my favorite. 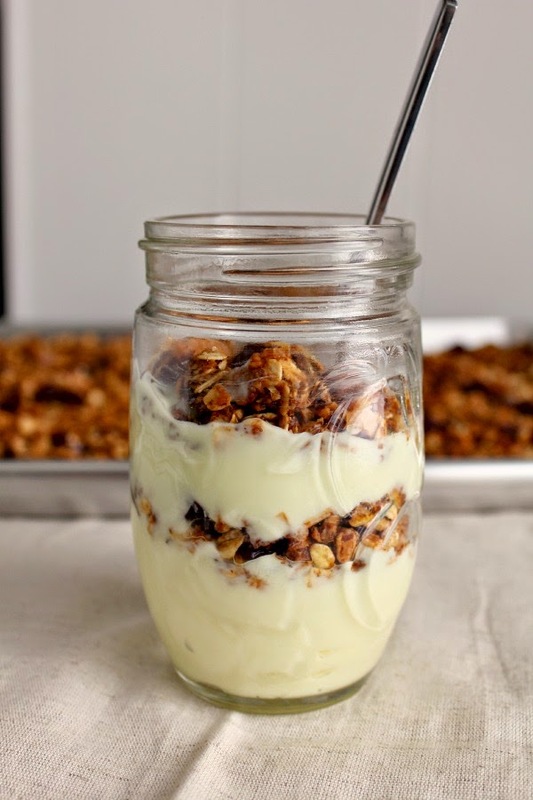 I absolutely love getting a bowl of my favorite yogurt and topping it with granola, or even layering the two together, like I did below. This is a very simple recipe and it comes together in no time at all. Most likely you have all of the ingredients in your pantry already too. 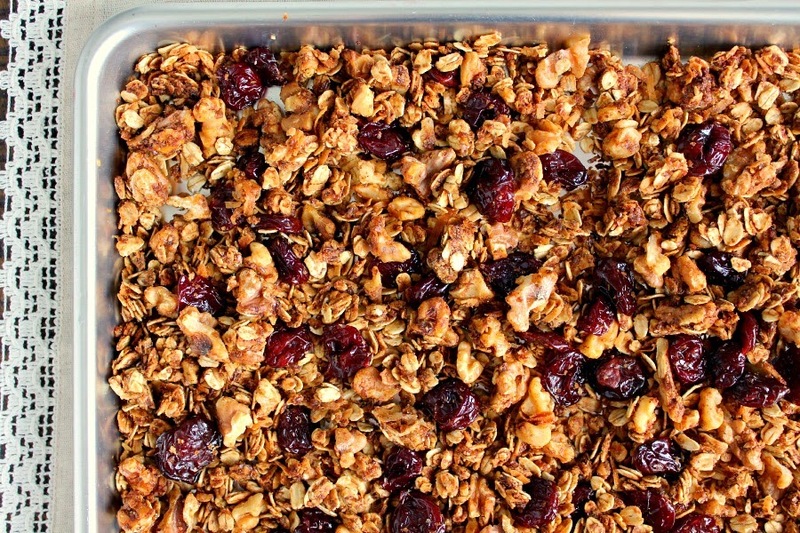 Whip up a batch of this granola and you'll have enough to last you all week long! Preheat the oven to 300 degrees. Spray a large baking sheet with non-stick cooking spray and set aside. In a large bowl combine the oats, walnuts, coconut, wheat germ and flaxseed meal and mix well. In a separate small bowl whisk together the honey, oil, cinnamon and vanilla. Pour the liquid mixture over the oats and use a silicone spatula to mix well and combine. Spread the oat mixture into the prepared pan in an even layer. Bake for 30-35 minutes or until golden brown, stirring after 20 minutes. Once the granola is done cooking, mix in the dried cherries. 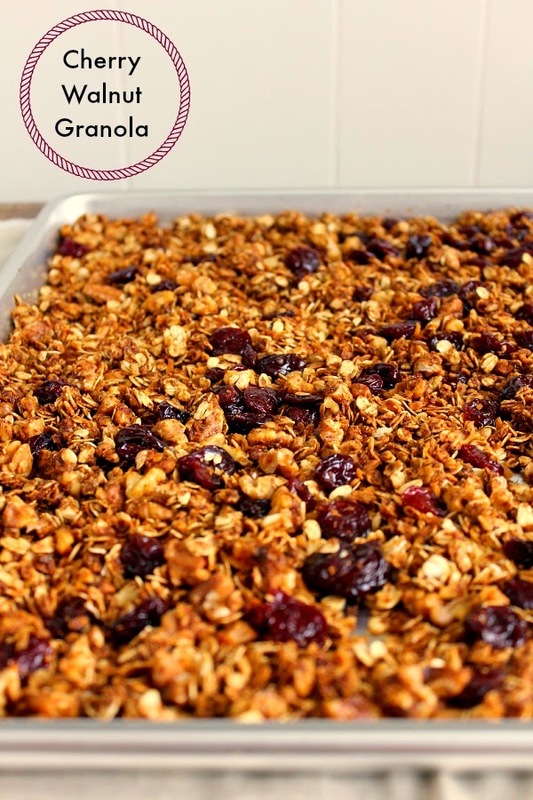 Spread the cooked granola onto a piece of parchment paper or a separate baking sheet to cool. Store in an airtight container at room temperature.